When I participated in Leslie Saeta’s annual “30 in 30” painting challenge last January I had prepared myself with reference photos I’d taken because I really wanted to paint them that could be done as a fairly quick sketch. 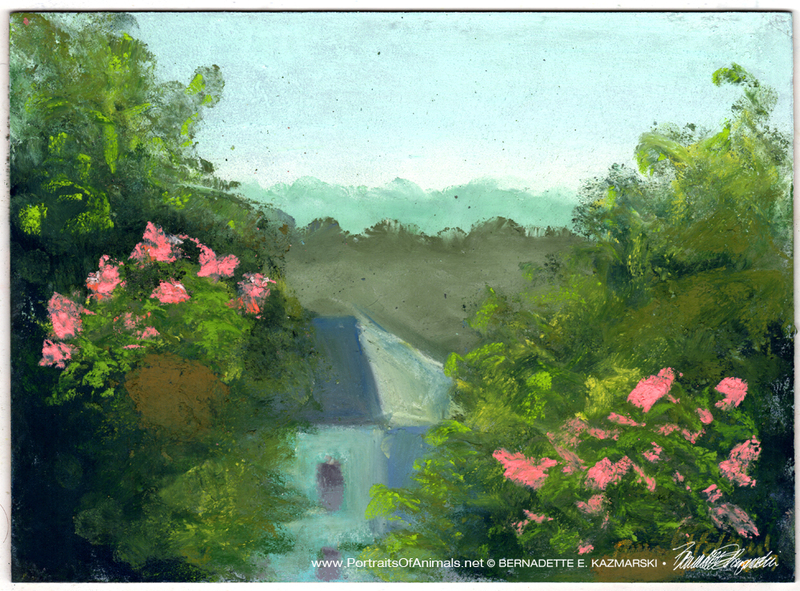 Often those quick sketches are really familiar things, like this view out my kitchen door, over the deck and past the coral geraniums I’ve had hanging there each summer for years to the mass of green from the trees in my yard and my neighbors’ yards and the hills beyond. On a summer morning, the sun illuminates the geraniums and catches highlights among the green but leaves most of the house in shadow. The hills beyond are hazy as they recede into the morning mist. You might never guess I live in a neighborhood where the houses are a driveway apart and all yards are interconnected, but in these old neighborhoods the mature greenery provides privace and shade along with the lovely interesting shapes and colors in all seasons. This was my painting for day 2. I enjoy these challenges, and I’m looking forward to tomorrow, though I have no idea what it will be. And take advantage of my special summer sale: all summer original artwork and prints are 25% off through the Autumnal Equinox with the code SUMMERSOLSTICE25. Click here to read more.